We arrived back in Texas on July, 10, 2009, and we were greeted by a crowd of family of friends. The trip to Corpus Christi was quite the adventure, and after a long day of traveling while in a full leg cast, we were ready to be home. It has been a crazy 2 1/2 months that has involved unpacking, summer school, doctor's appointments, apartment hunting, moving, fall classes, football games, and readjustment. We are finally settled and working on getting into the swing of things. John and I are both attending Graduate School at the University of Texas. We love living in Austin, and we have enjoyed catching up with old friends. We think about Belize often and miss our friends in Punta Gorda. We continue to stay in touch with our Belizean counterparts, fellow Volunteers, and friends. I will continue to volunteer with Teachers for a Better Belize as we work to provide professional development and school supplies to teachers and students in the Toledo District of Belize. We hope that you have enjoyed following our blog and reading about our adventures in Belize. We have enjoyed sharing with you, and appreciate your warm thoughts, kind remarks, and words of encouragement. We will continue to keep our blog for the next few months as a resource to those who are interested in Belize, Kiribati, and the Peace Corps. Be on the lookout for our new blog, describing the adventures of two graduate students. Thank you so much to all of our friends and family who have loved and supported us over the past two and a half years. It has truly been an amazing adventure that has changed who we are and how we think about the world. Hope your holidays are "Out of this World!" Merry Christmas & Happy New Year! The Texas Gulf Coast has welcomed us home for a short visit. It has been great to see some of our family and friends, and hang out in the Sparkling City by the Sea and the Birthplace of Texas Independence. We are heading South this weekend for Molly and Jerry's Wedding, and we will be back in Belize next week. Our Bags are Packed & We are Ready to Go! We have spent the last week scurrying around, saying goodbye, getting the computer fixed, celebrating our 3rd Anniversary, and of course packing. When we left Kiribati in April, June felt so far away, but somehow it sneaked up on us. The last two months have been a roller coaster, and we have enjoyed every minute of it! Thank you so much to our family and friends for all of their love and support. We leave early tomorrow morning from Corpus Christi to Miami. We will be in Miami for a few days, and then it is off to Belize! So check back for more about our adventure in the Peace Corps, again! Ain't No Party Like a Buc Days Party 'Cause a Buc Party Don't Stop! 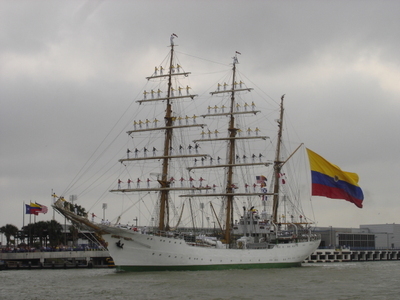 Yesterday the ARC Gloria, a tall ship visiting from Colombia, set sail and headed home. This marked the end of an exciting and very busy two weeks. The Rodeo is over, the BBQ Challenge has come to an end, the Illuminated Night Parade went on without a hitch, the Carnival is packing up, La Conquista rocked the house, and a new Miss Buc Days has been crowned. Buc Days is a Corpus Christi tradition, and we have enjoyed our time with the organization. We worked with some fantastic people and although we are exhausted, we had a great time. We are happy to announce that we are disease and parasite free after living in Kiribati for a month and medically cleared. We recently recieved our second Peace Corps Invitation, and we are headed to Belize. We will be leaving June 18th for staging, and training begins June 20. We will serve as Education Volunteers which will include teacher training in reading and literacy. We are so excited and we can hardly wait, and it seems as if a few of our fellow K36'ers may be heading to Belize with us. In the mean time we are working for the Buccaneer Commission, Inc., and we have been quite busy as Buc Days is quickly approaching. After a few flight delays, we are now home in Corpus Christi, Texas, safe and sound. We are currently awaiting medical clearance, as we are in the re-enrollment phase. We hope to share more information on our next invitation in the coming weeks. We are trying to get back into the swing of things here, and we are working on finding temporary jobs. So that you might get a peek into our lives as Peace Corps Trainees, we have posted some pictures of our adventure in Kiribati. 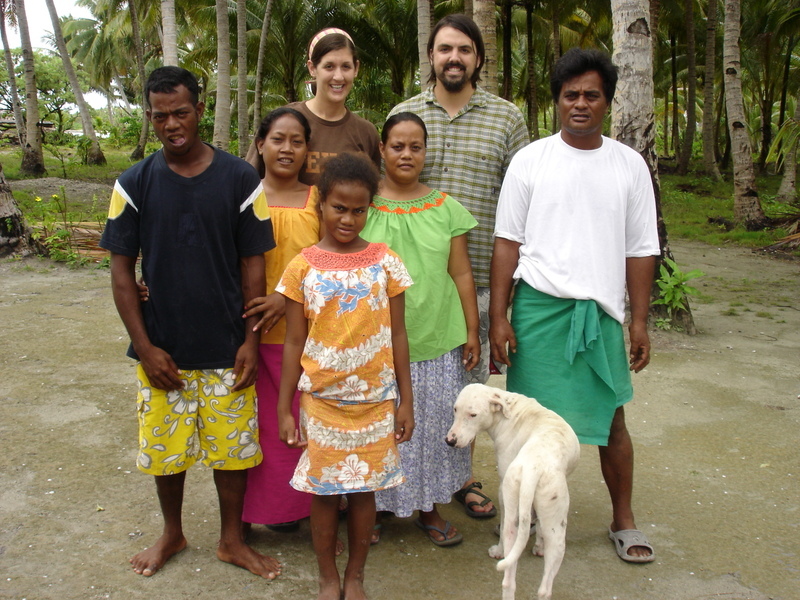 The I-Kiribati and current Peace Corps Volunteers were very generous and welcoming. We were sad to leave, as we truly enjoyed our time in Kiribati, and we miss our fellow K-36 ers. Now is the time to look ahead, and we are filled with excitement as we anticipate the news of our next adventure as Peace Corps Trainees. Click here for our Photos of Kiribati. We took a break from our current packing situation and had a nice dinner with our parents and grandparents. It was great to sit, relax, and enjoy each other's company one last time before we leave for Kiribati. John's mom even had some hilarious t-shirts made for everyone. We took some great goodbye pictures and had some good laughs about our upcoming adventure. 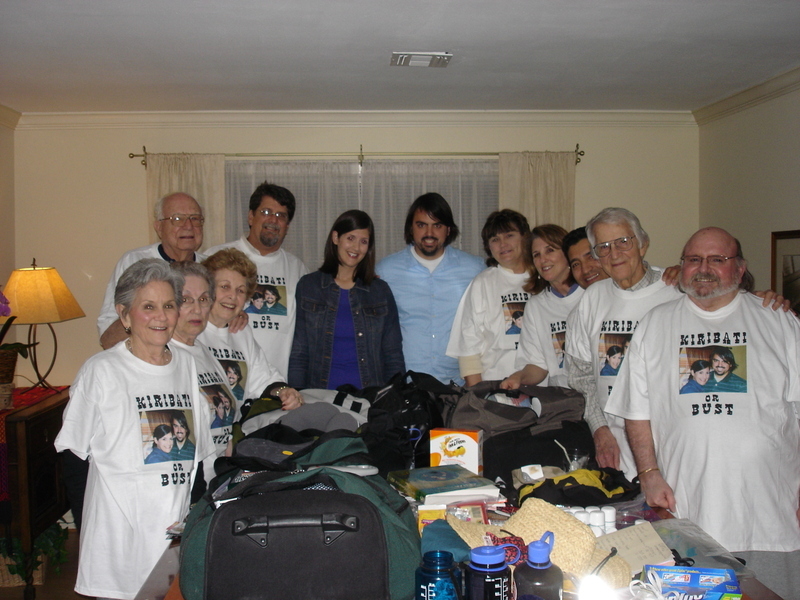 Here we are with our parents and grandparents, with their new t-shirts on, in front of the "Table of DOOM!!" Good-bye Uvalde, hello Corpus Christi, TX! The address has been changed, and we officially no longer reside in Uvalde. We are living in transition with Mica’s parents in Corpus Christi. We will miss Uvalde, and we truly enjoyed our time there. It’s a quaint little town with great people. We thought we would share a few photos with you of our lives in Uvalde. Here's a view of us from our apartment's front door. 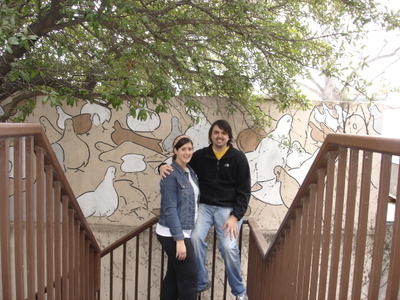 We had a great mural outside on the front porch. Check out the photo link to see more Uvalde pictures.